One of the obvious things that we all know is the fact that when an animal dies, it starts decomposing and a strong odor is released. 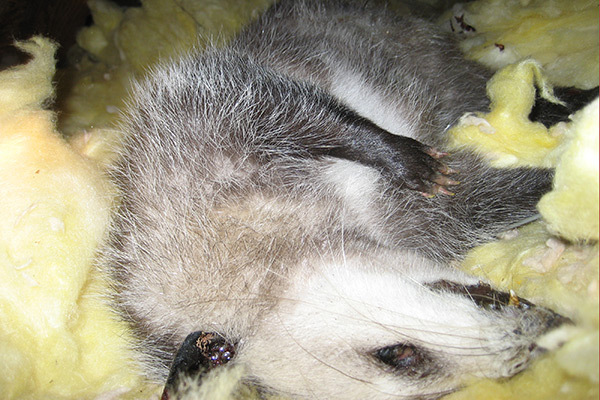 With opossums, it is not so easy to tell whether it is dead or not. This is because of the opossum’s ability to play dead. It faints and takes all the characteristics of a dead body, and this includes the really foul smell. At times, the opossum can die in areas where you cannot find it but the odor tells you that there is indeed a dead animal in the vicinity. When you smell such an odor in the house, you need to narrow the search down to the room where you smell the odor in a more concentrated way. The architecture in such an area needs to be examined. You need to ask yourself how the animal got in. Where exactly is the hole? Is it above or below? You then have to sniff around the place. Walk around as you stick your nose near the wall and floor. You also need a ladder so as to reach the ceiling and smell there too, even though it is a very gross thing to do. When you are near the body, the odor actually changes very sharply. The change isn’t all about the intensity; the nature of the smell also changes. When you find that kind of an area, you can cut a hole in the wall or crawl into the attic or beneath the house to the place where the body is located. If you cannot find the opossum, then you have to continue sniffing. After you have found the opossum’s body, it is time to pick it up and bag it. Make sure that the detritus is mopped. You now need to spray that area using disinfectant to kill any pathogen that may be left behind by the body. Removing a dead opossum is never easy as you have to keep on crawling and sniffing in some pretty hazardous conditions. If you don’t want to go through the above steps, it is always possible to access the services of a professional who can handle the problem for you quickly and expertly and disinfect the area in the safest way possible. This is the first step that many people take rather than trying to find the body themselves.